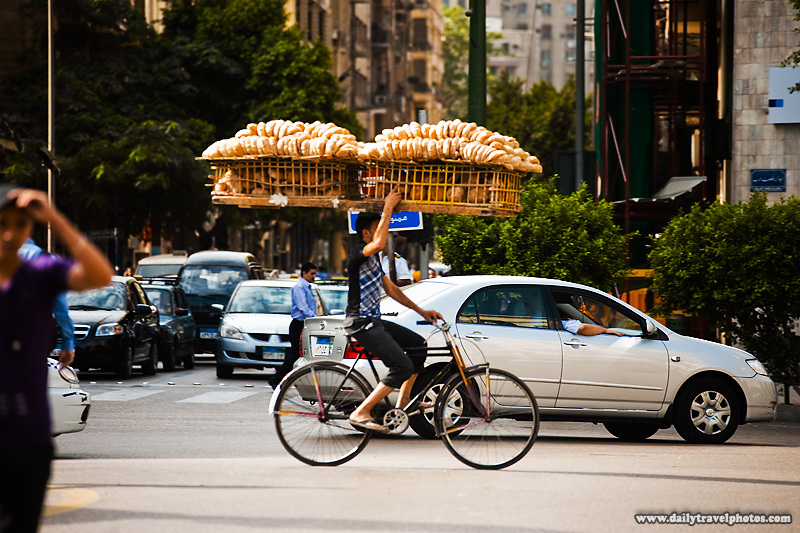 A bicycle bread delivery guy steadies a rack of bread with one hand through Cairo traffic. If you've been to Cairo, you know how horrendous, haphazard and lawless the traffic is. For motorists, people represent little more than obstacles to dodge while traveling at mach 2. That's what makes these smooth-as-silk bread delivery guys so incredible. They're all over Cairo but I've never seen them once even slow down. They weave in and out of traffic like a ghost to deliver their important shipment of leavened cargo. 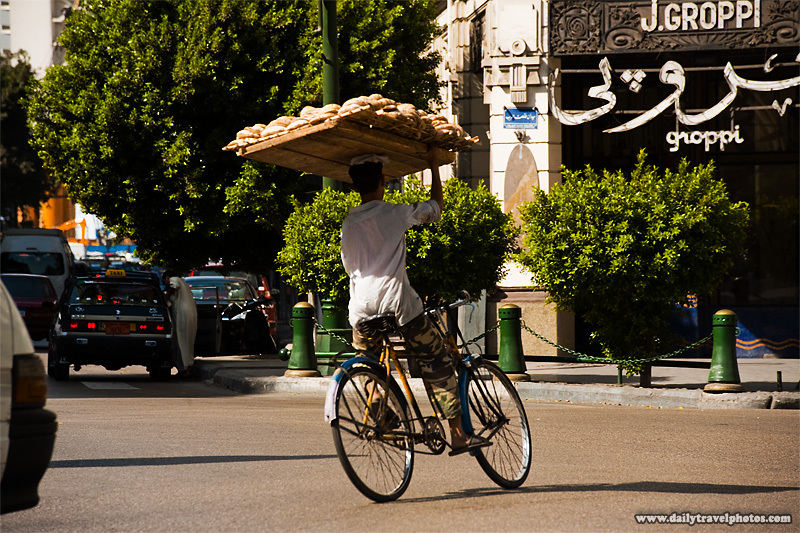 A bicycle bread delivery guy makes a turn in downtown Cairo after dodging a car. The bread rack also leans as the bicycle turns. It must be noted, the delivery guy is doing this while steering one-handed AND trying to avoid becoming road-kill! 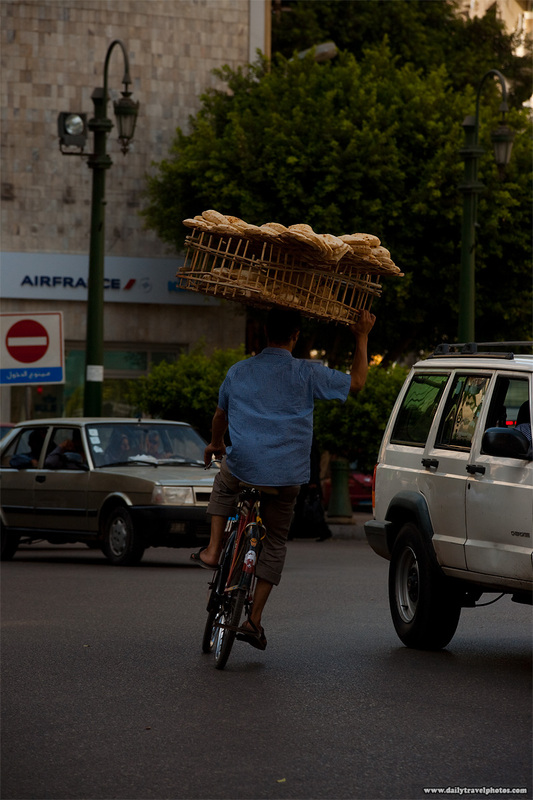 A bicycle bread delivery guy ducks behind fast moving traffic in downtown Cairo. All of these photos were taken at Talaat Harb square within a 1 hour period. Note, all the bikers are different. Bread is constantly in transit all around town like this. Just absolutely amazing acrobatics on the bicyclists part! Fantastic photograph, I love how clear and crisp they are. Brilliant timing too. You gotta admire these guys, they're brave too! WOW the first one on top is A LOT of bread!! @Londoneye... thanks! Yup, you nailed it. Bravery is defined as going completely in the wrong direction against oncoming vehicle traffic! @alee... that's actually one of the larger loads that I've ever seen also, now that you mention it! I swear it... there will be more of these photos to come. I saw one today actually snaking through the tiny back alleyways of Islamic Cairo with a full load on his head! hello, i'm admin of the Cairo studio blog. I wanted to ask your authorisation to use one of the pictures published in this article. Your pictures are the most relevant to our subject "The hidden order in Cairo's Urbanism"
NB. Copyright of course reserved.